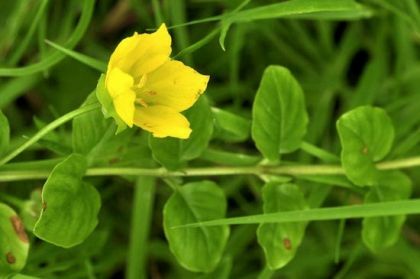 Creeping-jenny is a perennial, hairless and evergreen plant which is found in damp meadows, near rivers and in wet ditches. It grows very low, sometimes submerged in pools lying on shady, sodden ground, rooting at nodes as it crawls along. 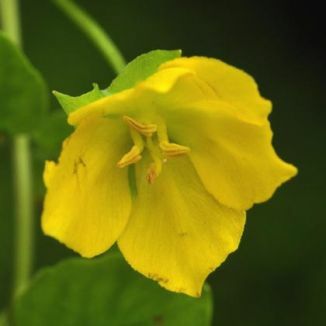 It bears pretty, yellow, cup-shaped flowers (15-25 mm) which have five pointed lobes and these flowers emerge at the axils of the leaves, blooming from June to August. The leaves are short-stalked, ovate, opposite and softly heart-shaped. This plant is classed as native, with a small original range, and is now widespread. It belongs to the Primulaceae family. I first recorded and photographed Creeping-jenny near the river Nore at Inistioge, Co Kilkenny in 2010. Deemed to be quite a useful plant among herbalists, Creeping-jenny was known to Culpepper as Moneywort which he recommended as 'singularly good to stay all fluxes…. And weak stomachs given to casting'. Lus an dá phingin translates as 'Two-penny plant'.